I recently created a module to teach programming with Java to beginners on Learneroo. Why might Java be worth learning? I summarize some reasons in the first Java node. There's another point worth emphasizing, which is the Job Market. 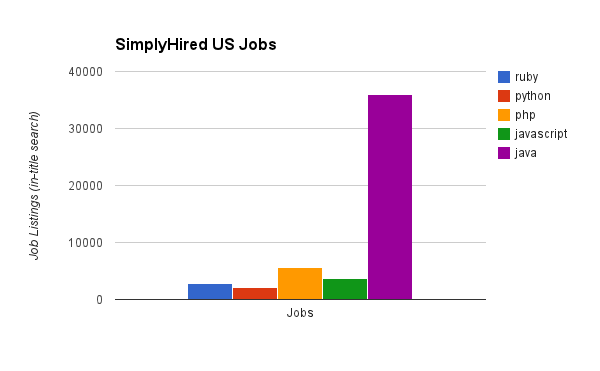 A while ago I searched various Job sites for the number of jobs available for each programming language, and Java came out on top of the big sites. Below are the results from Monster.com for jobs that tagged specific languages as skills. For more information, I created a Google Spreadsheet with job data from different websites.